GIVE your home a makeover this Monsoon with artisan carpets designed by rural weavers in Rajasthan. The ‘Artisans Originals’ collection has been curated by Jaipur Rugs and each piece has been designed and hand woven by local crafts people with over two decades experience. Take for instance the rug named ‘Khushboo’ that has been conceptualized by Sunita Devi and Laxmi from Udaypuriya village – the women took inspiration from the rectangle boxes that make up the Khatiya (cot) in their courtyard. Similarly, the ‘Gochin’ rug has been designed by Sajana Ji who wanted to celebrate elements from her family home and local ceremonies. 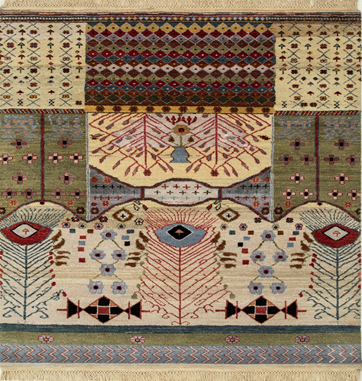 Accordingly, the rug includes diamond shaped motifs drawn from shakarpara, a popular village snack and flowers that take inspiration from kalash, a pot weaver use for gardening. The 4x6 feet rugs are priced at ’70,560’, while the 8x10 feet ones are at ‘2,35,200’. Décor enthusiast can visit the Mehrauli – based store for more details.